We’d love your help. Let us know what’s wrong with this preview of What Lay Beyond by Diane Carey. Created by the incalculably ancient Iconians, whose transcendent technology is quantum levels beyond that of the Federation and its allies, the Gateways offer instantaneous transport across unimaginable distances. Throughout the known galaxy, from Deep Space Nine(TM) to the New Frontier, from the Delta Quadrant to the bridge of the "Starship Enterprise(TM)," the sudden rea Created by the incalculably ancient Iconians, whose transcendent technology is quantum levels beyond that of the Federation and its allies, the Gateways offer instantaneous transport across unimaginable distances. Throughout the known galaxy, from Deep Space Nine(TM) to the New Frontier, from the Delta Quadrant to the bridge of the "Starship Enterprise(TM)," the sudden reactivation of the Gateways has destabilized interstellar relations between planets and cultures previously separated by countless light-years. Starfleet's finest have coped with the crisis as best they can, but circumstances have forced several valiant commanders to leap through separate Gateways into the unknown. Captain James T. Kirk of the original "Starship Enterprise"
Captain Jean-Luc Picard of "Star Trek: The Next Generation(R)"
Colonel Kira Nerys of "Deep Space Nine"
Captain Kathryn Janeway of the "U.S.S. Voyager(TM) "
Captains Calhoun and Shelby of "Star Trek: New Frontier"
Commander Nick Keller of the "U.S.S. Challenger"
"What Lay Beyond" brings the Gateways saga to aspectacular finish, in an all-star collaboration by six popular, bestselling "Star Trek" authors. To ask other readers questions about What Lay Beyond, please sign up. This is a book that I really enjoyed reading. Despite the fact that I've seen in several reviews that the whole idea of having this book, with all the different endings from the previous stories, wasn't very popular. I admit that for me it did have a somewhat negative effect when it came to how well I remembered the beginnings of each story, and had the ending been in each book it might have made it just a little bit easier. But I wouldn't say it was a problem as such. I read this series in a pe This is a book that I really enjoyed reading. Despite the fact that I've seen in several reviews that the whole idea of having this book, with all the different endings from the previous stories, wasn't very popular. I admit that for me it did have a somewhat negative effect when it came to how well I remembered the beginnings of each story, and had the ending been in each book it might have made it just a little bit easier. But I wouldn't say it was a problem as such. I read this series in a period that spanned a little over six months, and I could without problems read this book without having to re-read anything from the previous books. But if you were to read even slower than that you might feel the need to refresh your memory a bit more. I should mention that I'm also of the opinion that cliffhangers can be a good thing, at least if you're planning on reading the whole series to begin with. So now let me tell you what made this book so great. First of all I either really liked or loved the endings. I would say that they, in large, were even better than the beginnings of the story. Even the story with the Challenger crew (that I did like, but not as much as the other ones) I thought had a really good ending that made me like that story even more. I would say that there were strong endings well worth the wait. And if you have questions like how the gateway technology came to be, if Picard and the others will actually get to meet the real Iconians or maybe just what happens on the other side of the gateways; this book will answer those questions for you. So all in all; a really good ending to an interesting series within our beloved Star Trek universe. Overall this is a series of short stories / novellas from each of one of the prior Gateway novels, and/or a direct tie-in from a main series. It finishes up the Gateways series and some loose ends from the main series themselves. Getting to "see" the Iconians during these stories was very interesting - especially their viewpoints and the "respect" they have for at least one other very ancient race. In One Small Step (Gatewa Overall this is a series of short stories / novellas from each of one of the prior Gateway novels, and/or a direct tie-in from a main series. It finishes up the Gateways series and some loose ends from the main series themselves. Getting to "see" the Iconians during these stories was very interesting - especially their viewpoints and the "respect" they have for at least one other very ancient race. In One Small Step (Gateways #1) by Susan Wright, when Luz and Tasm, two of the Petraw (a race of scavengers that search out the technology of other races for their own use and advancement), steal the vital Gateway component and flees to their homeworld through the Gateway, Kirk follows. One Giant Leap covers what happens after they all arrive on the homeward of the Petraw. Directly following on the heels of Demons of Air and Darkness (Gateways 6, DS9 46?) We discover what happens to Kira when she passes through the Gateway to escape a nasty Theta Radiation demise in the Gamma Quadrant while helping with the evacuation of Europa Nova. (view spoiler)[ In Horn and Ivory, Kira finds herself stranded on Bajor, some thirty thousand years before her time. She gets engaged in a civil war, fighting alongside General Torrna Antosso on the Perikian Peninsula, and she later becomes his adjutant. It is the days when Bajor was still broken up into different factions, but already, the "Bajora" try to unite the planet - with the help of the Prophets. In the meantime, the Fire Caves have collided destroying the port and city of Agilva, it was the time when the Prophets captured the Pah-wraiths there. Kira and Torrna later become prisoners during the waves of the war, but they manage to escape. Back on the peninsula, Torrna is desperate - his wife Lyrra and his children were all killed during the war. Kira tries to pummels some sense into him and reminds him of his duties. Kira finally travels to the Fire Caves and finds another Iconian Gateway there. When she steps through it, she briefly meets an alien which apparently is truly an Iconian, and he sends her back to DS9. Completes the Voyager novel No Man's Land (Gateways #5) by Christie Golden, In the Queue details the origins of the gate system. Follows Cold Wars where Calhoun and Shelby were left battered, bruised and near death. (view spoiler)[ Calhoun and Shelby find themselves on the other side of the Gateway where they are forced to continuously relive a past event on Calhoun's homeworld of Xenex, dying over and over again . They have traveled to Kaz'hera, the Xenexian version of the Valhalla, the afterlife. While it does present the character of Calhoun with an opportunity to confront his own past, and Calhoun and Shelby as newly married characters to explore what they feel for each other. I am under the impression this takes place nearly immediately after they were married (the fact they are married is referenced in Section 31: Abyss ). (hide spoiler)] Frankly this one could have been written anywhere - didn't have much to do with the overall context of the Iconian Gateways. It feels like they just needed to include *something* from this series. Doors Into Chaos (Gateways #3) is the key to the entire series. Picard, having a background of sorts with the Iconians and their Gateways, is the logical leader of the cooperative effort to find a way to shut down the Gateways that have opened all over the galaxy. In Doors Into Chaos (Gateways #3) the story is used to illustrate the magnitude of the crisis facing the Galaxy, and to establish that it is indeed the race of the Petraw that we met in the first novel who are behind the awakening of the Iconian Gateways. (view spoiler)[ With the scam they are trying to pull off this time they realize that they have grossly miscalculated. When confronted, they admit that they did not know what all of the consequences of so many active Gateways would be and that they don't know how to turn them off. Picard's journey through a Gateway is a desperate attempt to locate the ancient Iconians and find a way of shutting down the entire Gateway network. Picard does indeed find the descendants of the Iconians and while they themselves cannot help him, they do provide him with the information to try to accomplish the deed himself. He must locate the Master Resonator, a device that, when located, should shut down the network of Gateways. After being sent on his way Picard finds himself on an alien world, once populated by the Iconians. With the aid of a local inhabitant discovers that instead of just one device there are 14. Thankfully there is also a map of sorts that tells Picard which Gateways the resonators must be inserted into. Had to skip the first couple of stories in the collection as I could not remember the books well enough! Much like the series it concludes, the quality of these stories was mixed. Each novella provides the ending of one of the unfinished novels that made up books one through six. The Kirk closer was not awful, but it felt lackluster and obvious compared to the first part of the story. The Keller conclusion I actually liked, even if the ending came completely out of left field. The DS9 exploration of Kira's journey was just as good as the preceding novel. Easily the strongest concluding story. I can Much like the series it concludes, the quality of these stories was mixed. Each novella provides the ending of one of the unfinished novels that made up books one through six. I can't really judge the Voyager novel since I didn't read it, but its conclusion was silly. I also didn't read the Calhoun and Shelby book, for which the concluding novella makes me glad. Pretty sure M'k'n'z or whatever would have been laughed out of the room by the D&D players in Stranger Things. I basically skimmed this one to see if it had any impact on the larger story, and the only hint that it might was never picked up again. Apparently Chekhov didn't carry a phaser. The TNG conclusion was about as shoddy as the TNG novel, if you could call it that. We see the return of Incompetent Riker and Badass Troi, though not the recurrence of Nervous Data. The reprised bad guys from a Voyager episode never actually turn on anybody. Yawn. And most of the "action" is Picard playing Space Jesus to a planet full of NPCs from Ocarina of Time. Completely lackluster. So for the series as a whole.... The DS9 novel and novella were decent. The Kirk novel was fun and the Keller book was ok. I kind of regret wasting my time on the rest of it. I always liked TNG, which is why it hurts to see it done so badly. I was confused at first, then when I went to rate this book I found that it was book 7 of a seven part series. In all fairness the ending was ok. but I think that I would have enjoyed it more if I had read the whole series. So I will just say that this is a good read and I love that like Generations it brought Capt Kirk into the same book with Captain Picard, not interactive but still fun. I will read the series in order and rate this book again after. Overall, a pretty good conclusion to the Gateways series. Each section was written by the author who wrote the corresponding book in the series, which unfortunately means that the quality varies widely between the sections. Star Trek TOS: Purely meh. This one introduced the antagonists. There's really not much else to say. Star Trek Challenger: Had nothing to do with the rest of the series and was the worst written one. Can be skipped without missing a single thing. Star Trek DS9: Kind of a weird o Overall, a pretty good conclusion to the Gateways series. Each section was written by the author who wrote the corresponding book in the series, which unfortunately means that the quality varies widely between the sections. Star Trek DS9: Kind of a weird one, but not too bad. Star Trek Voyager: Has a cameo by one of my favorite characters, so I'm happy. Star Trek TNG: Okay, this one makes up for the meh-ness of some of the others and put this book firmly in the 4-star territory. Picard's experience as a (view spoiler)[Young God (hide spoiler)] was kind of odd, but his quest itself was intriguing. Cheap marketing ploy of taking the last 4th of each of the previous novels of the series but it worked--I bought them all. I will only give my quick thoughts on the New Frontier story which I consider to be chapter 16 to that overall series. Captains Shelby and Calhoun find themselves in the Xenexian vision of the afterlife, and try to figure out if they are actually dead. There is sadly no closure to the dangling plot lines from Star Trek: Gateways: Cold Wars. Most frustrating of the unresolved Cheap marketing ploy of taking the last 4th of each of the previous novels of the series but it worked--I bought them all. Oh, this made me angry. I refused to pay full price for this, which was a 36.50$ Canadian hardcover which was nothing more than six completed short stories to six previous novels that were in paperback, that didn't actually have their endings included. From a "cliffhanger" point of view, I had indeed wanted to know what happened, but from a marketing and make-the-customer-happy point of view, this was a huge mistake. So, I'll middle-ground it around 2 stars (1 for the function of how the book wo Oh, this made me angry. I refused to pay full price for this, which was a 36.50$ Canadian hardcover which was nothing more than six completed short stories to six previous novels that were in paperback, that didn't actually have their endings included. From a "cliffhanger" point of view, I had indeed wanted to know what happened, but from a marketing and make-the-customer-happy point of view, this was a huge mistake. So, I'll middle-ground it around 2 stars (1 for the function of how the book worked, 3 for the endings of the stories). I did find a copy at a used bookstore, which I nabbed. This book contains the endings for the other books in the Gateway series. It felt like they just chopped off the last few chapters of each book, and collated them all into this hardcover. I remember the individual stories were good, but I was very annoyed at the gimmick. Also, I read this one last, so I had somewhat forgot the details of the earlier novels or had stopped caring. This book includes the last chapter of each of the first 6 books. Kind of stupid in my opinion. I read book 3 only since I just like reading the TNG series so had to get this book so I could read the end of the story (about 100 pages). Sadly, this ending was fairly incoherent in some parts, and overall was a bit disappointing to me. This is the last chapter of each of the previous Gateways books. It is not the kind of book you can read in isolation, I am tempted to say it was a marketing scam. But onto the stories. The 2 stand out ones were Voyager and Next Gen. I thought the Voyager one was clever and unexpected, full of real character. The next gen one finally finished off all the stories well. A good read. 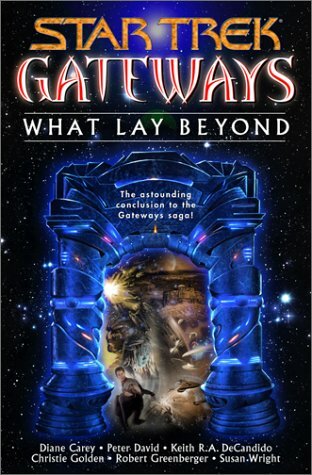 The gimmick of the Gateways series wasn't the Iconian gateways, it was that, no matter which one you read, you had to buy two books to get the entire story. What Lay Beyond was basically the last chapter of Gateways 1-6. This is really a half-witted way to finish off a big crossover event. I read just two of the stories before giving up, the Next Generation and New Frontiers stories, and found them both mediocre or worse. I thought this was better than the rest of the series, which in general was only ok. The conclusion to the prior six Gateways novels. Although I liked the stories, I found the conclusion to be somewhat unsatisfying. Another book I had to read to get the series completed.